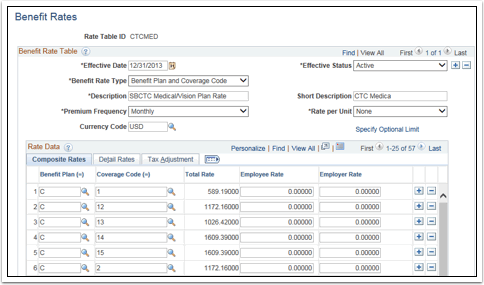 Purpose: Use this document as a reference for how to view the benefit rate table detailed information in ctcLink. Use the Benefit Rates Table page to view rates based on specific dollar amount. Rate tables are maintained centrally by SBCTC staff. Click the Search button to display the list of all Benefit Rate Table IDs. Click the CTCMED rate table link to display Rate Data details for this table. This page is used to create rates that are based on a specific dollar amount. Click the Detail Rates tab to view the total rate, employee before-tax and after-tax rate, and employer contribution non-taxable and taxable rates, for every Medical Benefits Plan/Coverage Code combination. Click Return to Search and select LF0206 from the list to view a list of Life Insurance Rates. These rates are per thousand dollars of coverage and are specified by age and by smoker status.